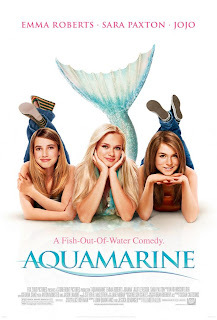 Aquamarine is a film about two best friends called Claire and Hailey they grew up together and went everywhere together then all of a sudden Hailey's mother got a new job somewhere else so she has to move soon so they tried to figure out a way that Hailey would be able to stay but they are not having much luck with it. Until one night there was a big rain storm and when they woke up the next morning and went outside there pool was full of water but that's not all that they found they were standing at one side of the pool and at the other end of the pool say saw a fin coming out of the water they thought that it might have been a fish but as it came closer to them they realized that it was a women at first they didn't believe what they were seeing but it turned out that they were right but it wasn't just a women she was a mermaid. Her name was Aquamarine but they called her Aqua she didn't know anything about humans she didn't even know what feet where or what dancing was when she came out of the water and dried her fin the fin would disappear and she would get legs but she didn't know how to use them at first but she started to get the hang of it then she explained how she swam away from home so that she could find a man to fall in love with her and if she could do that in a certain amount of time she would become human forever. she said to Claire and Hailey that if they helped her she would grant them one wish so they agreed to help her as they were going to use there wish so that Hailey could stay but Aqua didn't get someone to fall in love with her in that time she found a guy that really liked her but did not love her so then the girls didn't get there wish so they got split up and Hailey had no choice to leave and go with her mum. This is a great film for the whole family to watch.